Mayor turning government inside out to provide a public update about the ongoing effort to transform the Albuquerque Police Department. Mayor Tim Keller, Chief Administrative Officer Sarita Nair, and Senior Advisor for Public Safety James Lewis joined with APD Chief Mike Geier, Independent Monitor James Ginger and U.S. Attorney John C. Anderson to provide a public update about the ongoing effort to transform the Albuquerque Police Department. 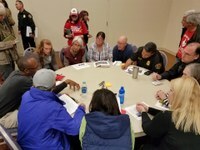 The Town Hall was an opportunity for the public to engage with efforts to transform APD including efforts led by Mayor Keller’s administration to move the department closer to constitutional, community policing outlined in a settlement agreement with the U.S. Department of Justice. The Town Hall was held a week after the latest status report by the Independent Monitor who is overseeing the settlement agreement. The monitor reported that APD is in 99.6% primary compliance with the agreement, and in 59.2% operational compliance, which means field personnel either perform tasks required by the agreement, or that, when they fail, supervisory personnel note and correct the behavior. APD has made substantial progress by developing a new use-of-force policy, hiring experienced leaders and moving toward community-based, problem-oriented policing designed to address community concerns and priorities. “I am more confident than ever that we can ensure all officers have the tools and motivation to always practice Constitutional, community policing,” Chief Geier said. Mayor Keller said APD had to overcome resistance to change from those who wanted to keep the status quo. View the status report here.